Very Good. 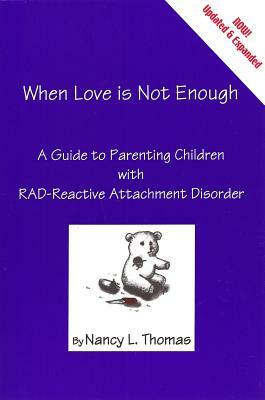 When Love is Not Enough: A Guide to Parenting with RAD-Reactive Attachment Disorder by Thomas, Nancy, 2008-08-11. Trade paperback (US). Glued binding. 141 p. Contains: Illustrations, black & white, Line drawings, black & white. Illustrated by Author Photo Back Cover. Very Good. 8.8 X 5.9 X 0.5 inches VERY GOOD CONDITION PAPERBACK; White titles on dark blue paper covers. teddy bear cover art. ; 141 pages; This plan was honed on some of the most difficult children in the US and has been used successfully to help thousands of children around the world. Children can learn to be respectful, responsible and fun to be with. This book tells the reader how to do it and then zaps them with a boost of encouragement to get started! Used-Good. No Jacket. Great copy, pages are clean but 2 are dog-eared.